Polls are open right now until Thursday at 11:59 PM. Cast your vote now! We are encouraging everyone to vote YES for the MPIRG referendum so that we can keep bringing you all of the programs and events you've seen from us this year, and so that we can do more to bring the voices of Carleton students to the people in power and make a difference on the issues that matter. We are also urging everyone to vote NO on the proposed constitutional amendment. This amendment reads: "Should the CSA Constitution be amended to add the following section? Sub-Section A. Any referendum, which proposes an additional line-item charge to be added onto the college comprehensive fee statement, will be valid only if the fee is an “opt-in only” charge levied through affirmative indication." This amendment would effectively abolish MPIRG forever, bind the hands of future generations of Carleton students, and restrict the power of the student body to make funding decisions through a democratic process. For information about our campaign to restore funding to MPIRG at Carleton, check out our "Why MPIRG?" page. 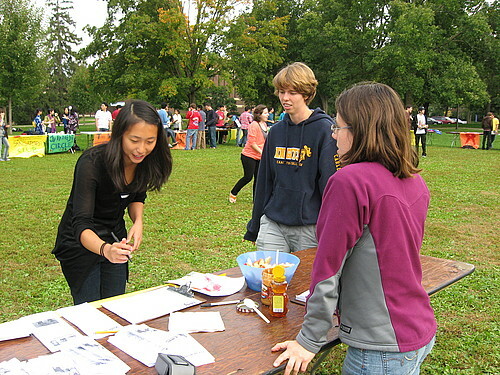 Then, read About MPIRG to learn more about MPIRG at Carleton and across the state. Also, check out our "Why an Opt-Out Fee?" page to learn about the MPIRG funding mechanism. Welcome to Carleton MPIRG! "MPIRG" means the Minnesota Public Interest Research Group, and "Carleton" means us. We're part of a statewide, student-directed nonprofit organization that works to empower college students in the political process. We make positive change happen in public policy across the state, in our local community, and on our campus. We meet every Tuesday at 8:15 PM in Leighton 304. Newcomers are always welcome! E-mail Ben Hellerstein or Elissa Walter, co-chairs of Carleton MPIRG.